There's nothing kids love more than a circus performance and Budapest offers a fantastic display of this Hungarian tradition. 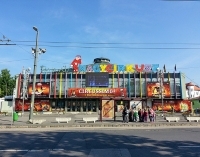 The Great Circus (Nagy Cirkusz) features an array of clowns, jugglers, and acrobats of all kinds to keep children happily entertained. Of course, adults should also be enthralled and impressed by the various acts. MACIVA, or The Hungarian Circus and Variety Ltd., plays an important part in Hungarian cultural life and is one of the oldest cultural establishments of Hungary. Built in 1954, the circus has a school for performing artists and holds circus camps for children who want to learn some of the skills on display. Special events like parades and festivals occur at certain times of the year but show times and prices vary according to the season, so please check the website for details. It is possible to book online.